Autumn has come and it is time for Orange! Orange Hearts and Leaves are falling in this bow. The top layer is an orange satin ribbon that has paisley patterns with sparkling hearts and lace within each loop. 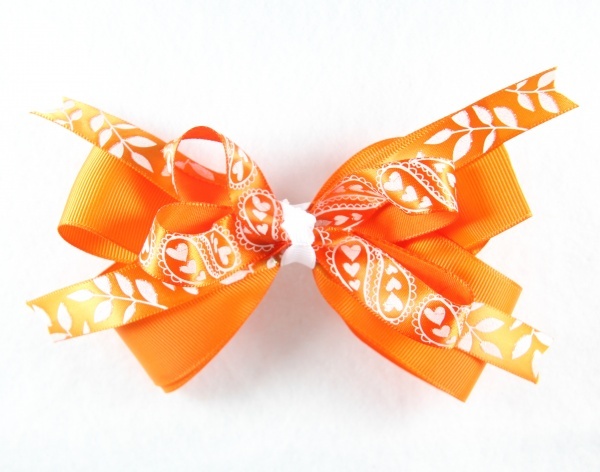 Then 2 ribbons of the white sparkling leaves on an orange satin ribbon. Finished with a solid orange 1.5" grosgrain ribbon all wrapped together with a white 3/8" white grosgrain ribbon. Happy Autumn Bow!